A company called Ultra Motor has released a new electric bike called the A2B. This bike looks great – I like the functional, minimalist style. The A2B is designed for urban or suburban commutes. According to Ultra Motors, the A2B offers unassisted power on demand for up to 20 miles at a cruising speed of 20mph. At that speed it’s still categorized as a bicycle as opposed to a scooter, moped or motorcycle. No special license is required. You can double the range by carrying an optional (and more visible) $399 secondary battery pack. You can increase its carrying capacity with the addition of baskets and rear carrier bags. The 73-pound bike is constructed with aluminum, and it features full suspension, and a 500-watt motor. The lithium-ion battery is well-concealed under the down tube. It is available at Amazon for about $2600. If you compare the one-time price of the A2B to the ongoing costs of commuting by car, moped or motorcycle–given the cost of gas, insurance, maintenance, parking, and parking tickets–it’s not so steep. “We found, in talking to folks, that (at) $2,500, it’s a considered purchase, but it’s of value to them,” Deyo said. Ultra Motor’s design team is in Germany, and manufacturing is in Taiwan. The company’s global headquarters are in London, with the US operation is based in San Francisco, California. Ultra Motor offers two other electric bikes, the Europa and the Portia. The A2B is expected to be available in September, most likely from bicycle, scooter, and motorcycle dealerships. I test-rode one of these A2B bikes, and it was MUCH nicer than any other electric bike I’ve ever ridden or owned. The A2B doesn’t feel “cheap” like most other bikes, and it is really powerful. When riding, you get the sense that if it was not artificially limited to 20mph, it could go much faster. Although I didn’t take it up any hills, my guess was that it could handle all but the steepest hills with no problem whatsoever. This bike is so far ahead of other electric bikes, that it really isn’t even fair or appropriate to compare it to other electric bikes. But as sweet of a bike as it is, alas, the $2,500 price tag is the deal breaker for me. That is some serious scratch for a bicycle. I suppose if you live in a city, and intended to use this bike for 50%+ of all your transportation needs, it would probably pencil out financially. But for a person like me – who would primarily use it to commute 4 miles (each way) for work each day – it would take years and years for the cost to be justified. Now, if gas went back up to $4+/gallon (which it very well could), the payoff could obviously be much faster. But until then, for me, this would really be more of an expensive toy than anything else. I also might worry about how long the company will stay in business, allowing the bike to be fully supported. Because at $2,500, I can’t imagine they’re selling many of these in a deep recession. I’ve also noticed that even the best electric bike companies in the past, have only been able to make it a couple years until they had to throw in the towel. I hope Ultra Motors is different! They could certainly help matters by lowering the price. At $2,000, I might at least consider buying. And at $1,500, I would buy one TODAY! Just got a chance to ride and review the A2B in New York City. Nice article. I like yur site. The electric bike commute is for those who can’t pedal, or if the commute is too long, or if you don’t want to arrive sweaty (late for meeting). The electric bike still is only 1/20th or less energy than a car commute. Considering a typical electric bike less than a kwh per 20 km, while it is important that the source of energy is clean, it is also important to use small quantities… Lightweight electric commuting is the low carbon answer for the mainstream, if there ever will be one. 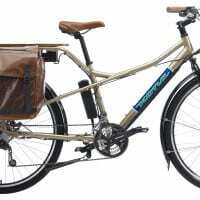 Even a hybrid uses 10 times more energy than an electric bike, at best. Marcelo Mena, Professor of environmental engineering in Chile. Perhaps it is moot to jump in on the zero-emissions debate, but the issue for all life activities is not whether CO2 is emitted by the process (it always is by burning or oxidative metabolism), but whether there is net production after subtracting the CO2 taken up by the prior growth of food or wood or whatever. Metabolism of food is a net zero-emissions process. Burning of fossil fuels is not because there is no ongoing compensatory uptake of CO2 by the creation of new oil (or at least not at any significant rate). Burning wood or forests is kind of in between because a large amount of stored CO2 is released suddenly, but it may eventually be balanced out (in theory) by tree / forest regrowth. True, most of electric bikes in the U.S. are currently coal powered. In Spain, there are 40% wind-powered. In Costa Rica, they are 99% powered by renewable energy. It’s all about how countries produce electricity, not the bike itself. And electric bikes, even if they are charged by 100% coal power, they still pollute far less than cars. Um…. even a vegetarian on a conventional bicycle breathes. Where I live (the US), this would more appropriately be called a coal-fired bicycle since approximately half of all electricity delivered to customers in the US is generated by coal combustion (according to US Energy Information Agency). Would you guys consider a book to not be “zero-emissions” since it’s possible to read it by coal-powered electric light? A regular bicycle is only zero-emissions if all of the food that the cyclist ate came from sources which never used an ounce of diesel fuel to grow, harvest, or transport it. Walking is only zero-emissions if the same holds true. Even if you eat only what you grow in your back yard, you better be sure how your metal shovel and spade were created, or it’s still not zero emissions. And what about the gasses released through decomposition of what you left behind in the soil or in your compost pile? Even just dying and rotting isn’t zero-emissions. Oh, and you guys forgot to mention that factored into the cost of the bicycle is the advertising for it, and internet-based advertising largely relies on computers which run on electricity from coal power plants. There’s no such thing as a truly ZERO-emissions human activity. Except, I guess, for holding your breath. But that’s not sustainable. Well do these bicycles also live in a house that has electricity? I have exactly what info I want. Check, please. Wait, it\’s free? Aweomse! Unless your electricity source is clean, then the loop isn’t closed on recharging, but it’s certainly a step in the right direction. Indeed, if the bike is recharged using electricity generated from coal, there are emissions involved. But bike itself has no emission. There many utilities that offer renewable energy as an option, and the bike could be recharged using a a single solar panel. Hey I purchased one its great and we also use wind generator produced power. When will this be available in the UK? September as well? I really like this, curioous is right though – it’s only zero emissions if you charge it from 100% renewable energy. But lets celebrate the little victories here, because they all add up. If people on scooters or motobikes start using these instead, that’s a good thing surely? The article fails to mention how the battery packs are re-charged. By reviewing the manufacturer’s link and navigating through the website, I eventually found this text: “Simply plug in to recharge. Pedal if you have no battery power.” Zero-emissions? Only if you use 100% renewable energy-sourced electricity.